Buy the Farm . . . Share: Oh, Fiddleheads! Here's the thing about fiddlehead ferns. Are you ready? Because I'm going to tell you. Sure, they look cool. They look like something that may have been enjoyed, long ago, by hungry dinosaurs. They look like they might even be dinosaurs themselves. Like their seasonal cousin, the ramp, they are only available during a very brief window during the Spring. For that very reason they are held in an almost mythical light in the foodservice business. I can remember my restaurant days where the chefs would all cheer at their first days of availability through our produce supplier. We would order them in and serve them up to all of our customers who marveled at their exquisite rarity. Fiddleheads are not bad. They're just not very good. They have an odd, slightly displeasing texture and not a lot in the way of their own flavor. After spending the better part of two decades trying to understand their allure I think I've resigned myself to the fact that I just don't like them very much. The problem with a vegetable that's only available in any regularity for 3-4 weeks a year is that that gives you 48-49 weeks to forget all of that and fool yourself into believing that have been longing for them all this time. Even though I forget about them every year for that entire time until I'm reminded of them when I see them crop back up at the market. Then I fall into their slowly plotted trap once again. As Jen stated before dinner tonight: "I think I like the idea of a fiddlehead fern much more than the fern itself." Ramps, on the other hand, are delicious. 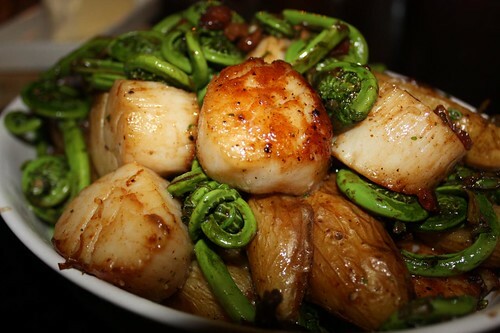 I got some nice sea scallops so I decided that if I rendered some bacon, seared the scallops, added in a little butter and olive oil and tossed the leftover fingerlings and fiddleheads that should make the ferns a little more appealing. It turns out I was right. What would have made this dish even more enjoyable would have been substituting something else for the fiddleheads. Maybe asapargus or a dark green such as kale or chard. However, I do not wish to throw away food, particularly rare food such as this peculiar fern. What is it that they say? Fool me once, shame on you. Fool me fifteen times, shame on fiddlehead ferns. I think that's how the quote goes. Only 51 weeks until I'm fooled again. i think it would be helpful for readers if you posted precise instructions on how to make these delicious-sounding and -looking dishes. i'm just saying. Interesting. Well, I never really give recipes because I don't use any recipes. I don't have amounts but I can tell you how I made this. 1.) I chopped up two strips of bacon, then rendered them in a pan over medium heat until they started to crisp up. 2.) Added a small pat of butter and a drizzle of olive oil. 3.) Removed muscles on scallops, tossed in a little olive oil, salt, pepper, and Old Bay seasoning. 5.) Removed scallops from pan. Added potatoes, and fingerlings, for maybe about 5 minutes, tossing until hot. 6.) Added scallops back to pan, tossed together and served. I thought fiddelheads were a sick joke perpetrated by Maritimers against Upper Canada. Heard them rapturously spoken about in hushed tones, ate some, never again. Figured out that I never saw the people who spoke so glowingly about them actually ever order or eat a fidlehead. Decided it was a big practical joke, people eat them once, find out they are terrible but then are compelled to pass along the joke like a long chain mail. Or in some cases eat them 15 times, each time with a sense of wonderment. Last year I enjoyed the fiddleheads. I think it was the exception that proves the rule.